Well...! 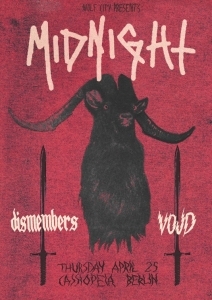 It was about time Ohio's unrepetant black/speed metal sinners Midnight paid a visit to Berlin. They made themselves quite rare in the last few year, at least in the Old World, even if they kept churning out venomous music in the form of albums and EPs. We've been asking, and asking, and were about to give up our hopes but, lo and behold!, here comes the monster stumbling on his drunken legs, walking across the ocean to Europe - for a whole tour, nonetheless! After all, "you can't stop steel". Opening the infernal proceedings will be local metal-rock'n'roll-from-hell dynamic duo dismembers and special guests VOJD - Sweden (formerly known as Black Trip, feat. members of Enforcer, Merciless and about a million other Swedish bands!) with their classy mixture of Thin Lizzy, early Maiden and classic, lean, melodic 70's rock. This will be one for the ages!